Villa Own simply steals your breath with its marvelous layout and stunning architecture. It truly is a representation of the unique Balinese culture and community living. Almost reminding you of the village environment, the villa has four bedrooms each given its own separate and distinct unit. High tapering roofs that keep the interiors cool is further enhanced by the air-conditioning in all the living areas. The suites come with bathrooms that open out to a garden setting, with tubs in stone finish; great on days you wish to have an elaborate beauty routine. Indulge your senses in the pool and rejuvenate yourself. The living space is common to all rooms having gorgeously designed sofa seating that is big on comfort. The dining space is right adjacent and the furnishing all around is so soft, pristine in colors and exuding its tropical charm. The resplendent paddy greens all around with swaying palm trees on the fringes of the property is a perfect setting, quiet yet close enough for you to enjoy the more commercial activities of Seminyak. You’ll however find it difficult to tear yourself away from the astounding beauty of Villa Own, its pure and serene environment and will wonder how such comfortable living could be created with the use of the most traditional of material. Enjoy the rustic feel of traditional Balinese furniture, the softest of hand-woven linen and the most magnificent pieces of hand carved curios. 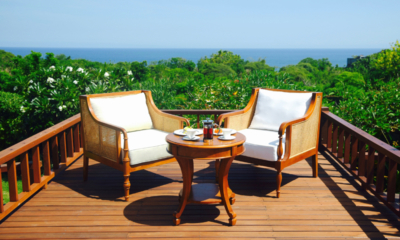 Read or bask in the sun on the deck chairs by the pool or get some great cooking going in the well equipped kitchen. Retire to the cool confines of your room in the afternoon heat, and soak in the evening glory by sharing a drink on the poolside. Wake up each morning refreshed and rejuvenated as Villa Own will give you the best in relaxation in the most gloriously natural environments. 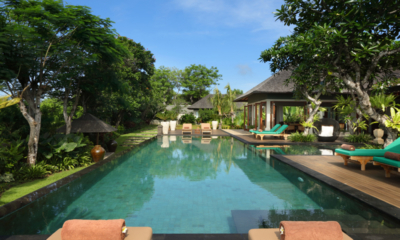 Another great villa for those wanting to experience the real Bali.